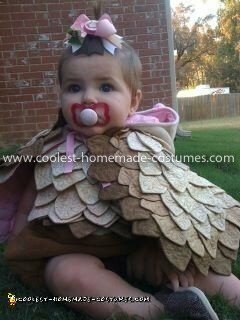 My little girl’s owl costume came from the booming inspiration of owl popularity this year and it seemed like a subject many people in my area weren’t thinking. I searched and searched the web looking for that PERFECT costume to buy and just couldn’t find it. 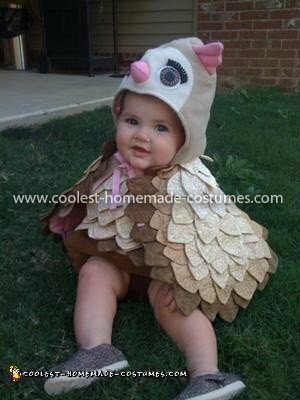 After discussing this with my aunt in Illinois we agreed that the pottery barn’s baby owl costume was the one we liked the best and would work from there. We ordered the costume and she decided it would be her mission to make it MORE fabulous! 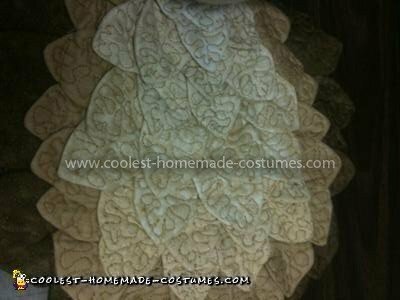 She cut out just over 100 feathers, quilted EACH one individually and began arranging them in shades ranging from dark brown to off white sewing them on the wings of the costume, then on the belly of the cody suit. After she mastered that she decided the eyes just didn’t quite sparkle enough so she did a layering effect to make a more bold eye even adding a glittery eye. 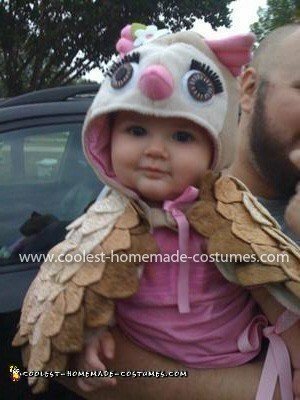 This Baby Owl Costume “wow’ed” everyone and my aunt didn’t skip one detail! It was beautiful! I was so sad we didn’t have more “outings” to attend to show off my aunt’s fabulous work so when I saw this site I thought maybe we could do her just a bit more justice. She is the most awesome woman in the world who never lacks in any detail when it comes to costumes! You wouldn’t happen to be willing to sell this would you? I am pretty sure I know the answer to that question, just thought I would ask! Hi I would like to purchase this costume do you sell them?